So let me throw this question out to everyone: what do you currently use to read online comics? I've gotten to the point now where I'm reading enough different ones that I really need to have things organized, so I don't spend an entire day clicking around through different locations and feed readers and whatnot. This morning, I did figure out a way to organize everything that might suit my personal preferences, but I'd like to solicit other thoughts on the subject. Effectively, what I've done then is created an old school newspaper comics section with all of the comics I keep track of in a single, handy location. Except for the comics on Zuda. Technically, I can build a gadget to pull in any given Zuda-based comic, but because they're Flash-based they would always open to the first page and noting updates would be decidedly more cumbersome. I could, I suppose, subscribe to the Zuda feed but that pulls in the notes (but not the comics) for EVERYTHING published through Zuda. Nothing against anyone there, though, but I'm not that interested in most of the stories. I might opt to pull in the Flash comics and see just how annoying it is for me to keep up with the updates manually. So that's where I'm with how I read comics online. I want to know how you read them? What works for you and what doesn't? Are you able to aggregate all your favorite comics into one location? Do you even want to? Do you prefer just running through a list of bookmarks and hitting the home page of every site? Or is this something which no one's really adequately addressed yet? 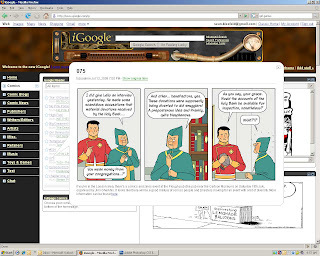 Try piperka.net which lets you add comics to your "list" from which you see when they've updated and saves your place in the archives.